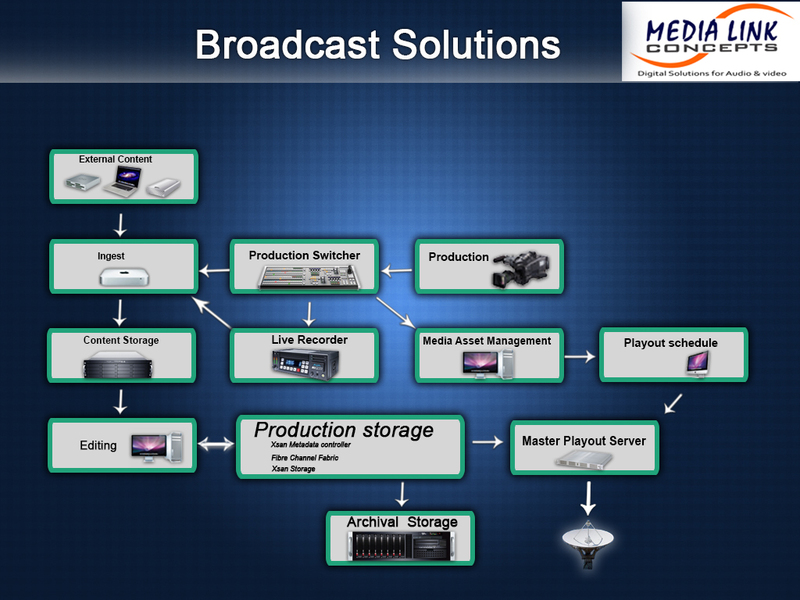 Media Link Concepts offers a total project management broadcast solutions. Acting as consultants from initial project planning, to live broadcast on air, the team can provide a fully integrated project management service. Our systems and technical infrastructure provides Consultancy, system Design, Project Management and Planning, Equipment sourcing and performance testing, integration and software configuration, on-site installation, acceptance testing, work flow technical documentation, training & commissioning for broadcast channels, either to integrate new channels or upgrade the existing channels. Our experienced and well trained engineers with an in-depth knowledge of broadcast market enables us to provide the best in system design, Production Facilities, storage solutions, Integration, Installation, Testing, commissioning & final delivery to our clients. Media Link concepts, Digital Broadcast solutions Provider in South India. Our Broadcast Solutions Installed @ Leading satellite TV Channels ie SUN TV, Puthiya Thalaimurai TV, Thanthi TV, Jaya TV, ZEE TV-Tamil ,SVBC -TTD, Asianet TV, Mega TV,Captain TV,Cauvery TV etc.